All rules can be copied from one model to another provided they are the same master model. Right click and select Copy Rules. Highlight the destination component or component set. 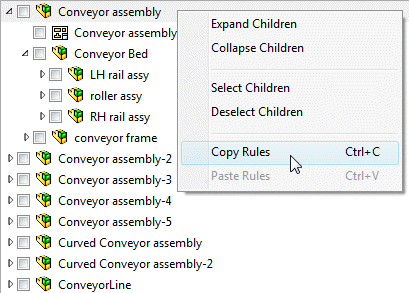 Right click and select Paste Rules. Model rules can also be pasted into notepad for reference and editing purposes. If they are edited and pasted back onto a model, you must ensure that all rules are still valid. The command bar displays buttons for all actions that can be performed on the Model list, including expanding/contracting and selecting/deselecting.